After design actions are taken, the ratings for Severity, Occurrence, and/or Detection are revised by the FMEA Team. Calculate and rate the revised RPNs. 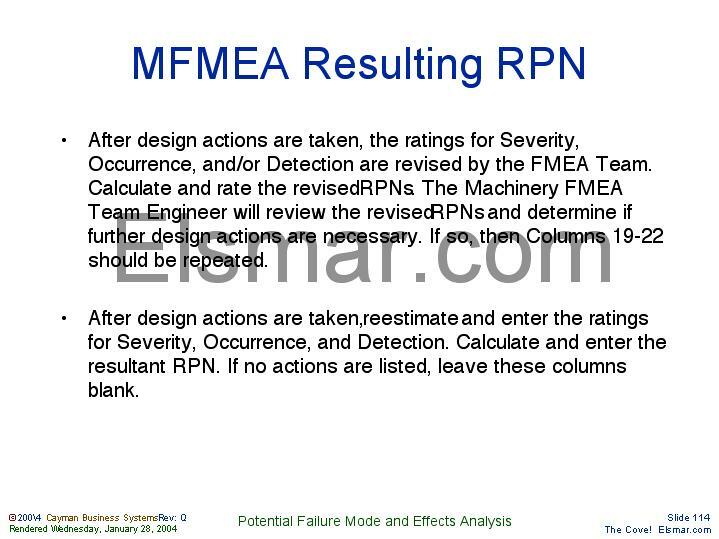 The Machinery FMEA Team Engineer will review the revised RPNs and determine if further design actions are necessary. If so, then Columns 19-22 should be repeated. After design actions are taken, reestimate and enter the ratings for Severity, Occurrence, and Detection. Calculate and enter the resultant RPN. If no actions are listed, leave these columns blank.